On May 14 and 15, Generation Beauty brought together the leading online beauty and fashion creators along with their passionate fans and top beauty brands for a weekend of inspiration, networking, and fun. To top everything off, there was goodie bags filled with beauty products for every attendee. If you haven't checked out what goodies were given, check out my haul which features every product I received during the event. Because this was first time Generation Beauty came to Toronto, I didn't know what to expect with the lineups, registrations, and crowds so I got to the convention centre two hours before doors were open. Was that a smart idea? Yes! When I got to the registration, there was no line. I walked up to the booth, scanned my ticket, got my lanyard badge and off I waited. Waiting in line for almost two hours was not fun but it does give you an advantage once you get inside the event. An advantage that I didn't quite take advantage of. You see, inside everyone's badge, there is a booklet with a map of where each brand booth is located as well as individual brand tickets which attendees hand over to the corresponding brand booth and receive a product. I'm not a fan of long line ups, so I decided to hit up the shorter lines and thought once the other lines (more popular / bigger known brands) shorten, I'll step in. Yeah, those lines never shorten - which forced me to wait even longer in the end. Lesson learned! While lines were formed at every booth, there were also meetups happening featuring some of ipsy's stylist. I didn't quite meet any - either because I don't know them or I was stuck in a line I wasn't going to give up after waiting over 30 minutes. I did however spotted a few from a distance and others that stood very close but I had no idea at the time who they were until fans ran up and asked for pictures. Speaking of pictures. The amount of pictures (mainly selfies and photobooth pictures) I took during the weekend was insane, in a good way. I normally shy away from taking selfies alone in public - even though it's kinda the norm thing to do nowadays. But at Generation Beauty, I didn't mind. I felt comfortable just snapping a few pictures. There were a few vloggers around who I met in line and they told me they normally feel awkward talking to a camera on the streets but here, they were carefree. I guess it also helped that the lighting in the room and at every booth was lit oh-so beautifully, hello ring lights! That's pretty much the goods of how Generation Beauty and my weekend ran. Now onto the not to good moments - something I think ipsy and brands should take note of if Generation Beauty returns. Organization; before, during and after the event. Besides the one email I got from Generation Beauty telling me to invite more friends to come to the event. I didn't hear a single word of the schedule for the two day event, who's going to show up when and where, and how long the day will be. I checked their social media channels daily only to see they're emailing everyone the schedule "Thursday" - two days before the event! Guess what, I didn't receive anything - I went through their website and found it under FAQ. While there was a schedule for meetups, it wasn't needed because practically everyone was waiting in line to get something from each brand's booth. The lines were long - mainly because there was one-on-one time with brand and guest, which I didn't mind. I wanted to connect with brands and learn about their brand, products, and what's to come in the later months. However, some brands took too long of a time (and even closed the line) while others rushed right through it with their elevator speech. Also, I think brands should know ideally how many people are in attendance, come prepared with a few extra boxes of whatever it was they're giving out, and organize an effective station so every guest can equally get the full experience with the brand. I won't be naming any names, but there were a few brands that execute it well while others need to re-evaluate for the next time. In the end, I'm not saying that the event was a complete let down - I still had a great time but a few minor tweaks would make the event worth the experience. 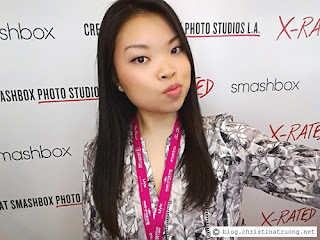 Did you attend Generation Beauty? How was your weekend experience? If Generation Beauty came to your city, would you attend?